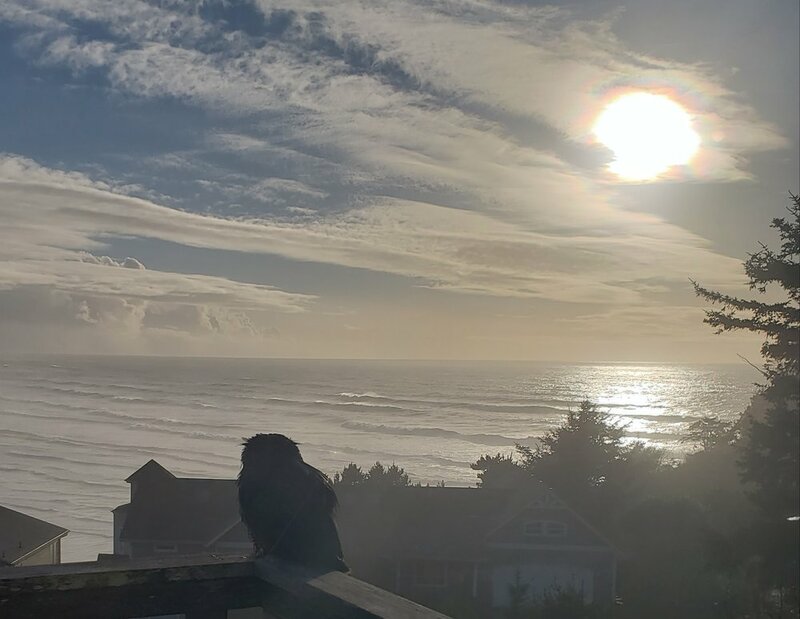 With all the sunshine and warm days we’ve had in Newport through the Fall, one would have almost forgotten about the intensity of storm season on the Oregon Coast. We owe a lot of artistic inspiration and admittedly forced studio time to it. Our reminder with a wet system that moved through with anticipated 50 mph winds with gusts to 65 snapped us into reality. Under normal conditions, those numbers would not be daunting. Sit back and enjoy a hot beverage as the walls shake like jello around you and wish you had windshield wipers for your windows to watch the show. If you have been to the Ozone, you know the door will slam shut on you or pull you with it while opening wildly in these conditions. If only the door hadn’t been put on backwards (lol). A break in the storm at sunset looks like this looking south from Yaquina Head at the city of Newport. Care to be out at sea in that? This little fella was happy not to be out at sea though he does have to make his way through a bunch of pine needles blown off the trees. Our gate was blown off the hinges and a side door to the garage almost went as well. I think we got hit with more than 65 mph. In fact, my precious rock piles with gems waiting in queue actually got blown around the yard. ROCKS, heavy rocks. When the sun came out, the Ozone ended up being dry. One year, there was a flood in the Ozone so I do like to check (yes a flood on the second floor, imagine that!). We did have interesting stuff around the yard that needed picking up; odd surf boards and whatnot. And who is hanging out here at the bird coup? The fluffy brown thing on the left side top of the coup (next to the surfboard) is a Great Horned Owl. This bird was wet and looked as though it needed to shake off a tough time in the storm. I think she had her eye on the chickens in the coup as well. She might end up painted, took some nice source pictures. An amazing panorama on Yaquina Head happened while walking Lily as well (being stoved up during a storm is torture to a Heeler pup). I will post that very soon! Until the next storm, this Great Horned Owl and I are going to enjoy the next sunset. Cheers.